If you ask people what the most graceful aircraft is, you’re bound to get votes for helicopters, stealth fighters and the like – but there’s just something special about blimps. These high-flying and buoyant crafts are sometimes viewed as a relic from the past, but savvy air hobbyists and professionals alike are helping to bring around a renaissance of sorts for the ships. Not only are blimps excellent for advertising, they also have the potential to make a real difference in the way the military handles cargo. Igor Pasternak, dirigible manufacturer, has big plans for his AerosCraft blimps. In 2013, his company managed to secure $60 million from the U.S. State Department to fund blimps for commercial cargo carry – a big breakthrough for airship engineering and exciting for enthusiasts alike. To do this, Pasternak’s engineers created the ultimate in airship technology: variable buoyancy systems. This means that blimps, which are great at rising quickly, will also be able to make controlled descents. With that problem out of the way, their capacity to haul huge amounts of cargo is excellent. However, the engineers of the future have to take inspiration from the past. 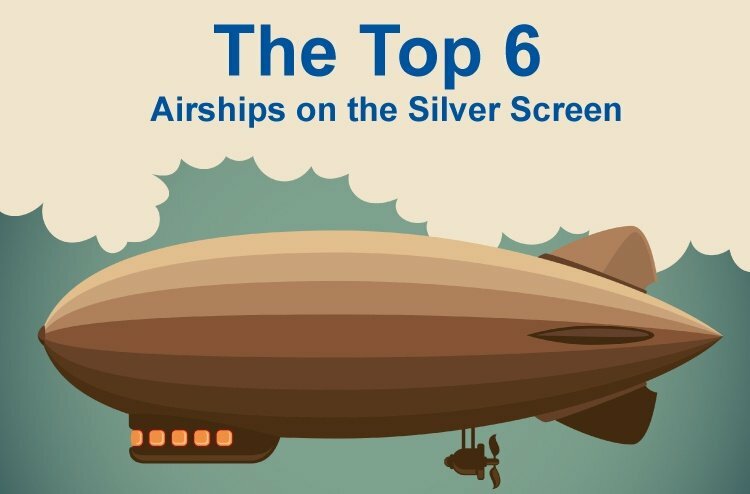 What better way to revisit blimps’ past than on the silver screen? If you pay attention, you’ll find that blimps play bigger parts in the movies than you might have imagined. That said, here are six blimps in big screen roles. Merging fact and fiction can lead to some pretty exciting stories, as we can see in “Indiana Jones and the Last Crusade.” This late ‘80s film involves an alternate history in which blimps are used as passenger transport – as well as a whole lot of mid-air hijinks. Synopsis: When Dr. Henry Jones Sr. suddenly disappears, Indiana Jones jumps on his father’s trail. In true family fashion, Jones must find his father and prevent Nazis from getting their hands on the Holy Grail. When it comes to crunch time, Indy and his dad choose the most immediate escape route available: a German zeppelin. With typical subterfuge and spy tactics on a comedic scale, Indy manages to secure a ticket-taker’s uniform and use it to toss a German officer out the zeppelin’s passenger deck window. Later in the flight, the zeppelin begins to turn around – which isn’t ideal for our two protagonists. At this point in their journey, the only way out is down, so they flee to the lower decks where they’re able to escape by way of a small plane attached to the bottom of the ship. 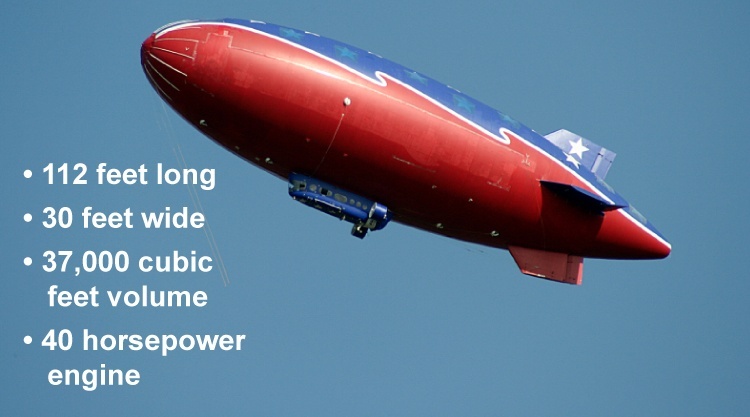 Bonus Fact: The designers got the idea for a plane attached to the bottom of a blimp from the plans of old U.S. Navy airships, specifically the U.S.S. Akron and U.S.S. Macon. They were a bit smaller than the zeppelin pictured in the “Last Crusade” film, and each was equipped with hangar space for up to four small planes. Notably, they had sky hooks beneath the ship to hold a small plane – which would have been used as a mail courier. This airship design harkens back to a time when blimps were envisioned as aircraft carriers, much like Igor Pasternak’s AerosCraft ships intend to become. Another action film entry, this movie doesn’t depict blimps as high-end passenger vessels. Instead, it shows the craft as a somewhat homely but extremely effective escape route. Synopsis: Imhotep’s mummified malfeasance isn’t over. After his corpse is shipped to a London museum, it’s up to Rick O’Connell to stop the awakened Pharaoh’s plans to wreak havoc on the world – again. Sidekick Izzy Buttons has lost his airplane through gambling, forcing Rick O’Connell to accept the dirigible as a means of transport to rescue his son from cultists in Karnak. Though it’s not the best-looking craft out there, it proves to more than make up for that in speed and stealth on the air journey across Egypt. In a fantastic sequence you have to see to believe, the returned mummy of Imhotep actually summons a gargantuan wall of water from the Nile to chase the blimp carrying our heroes until – alas – the airship is brought down. Sidelined but not defeated, the hardy dirigible ends up saving the day by allowing the safe passage of our protagonists and several other individuals back to civilization. Bonus Fact: The design of the blimp in this movie is a DIYer’s dream. To promote an ancient ambiance, the dirigible is described as a patchwork blimp attached to a 200-year-old fishing trawler and held together by mooring lines. While this vision touts performance over style, it’s an excellent reminder of how powerful dirigibles can be. As for the actual filming, the crew did their acting on a makeshift trawler, while the balloon itself was rendered digitally. Though dirigibles can undoubtedly make for excellent action and spy movie subjects, there’s an undeniable whimsy to them as well. No movie shows this better than the musical film adaptation of Ian Flemming’s 1964 novel. Synopsis: A widowed inventor named Caractacus Potts spins a fanciful tale about a flying car named Chitty, and the foreign Vulgarian villains who want to steal it for their own designs. The airship involved in this movie might be onscreen for a short period of time, but its plot relevance is certainly extensive. When Baron Bomburst of the fictional nation Vulgaria decides he wants Potts’ invention, he attempts to abduct Potts several times. Mistaking Grandfather Potts for the inventor, the baron deploys a massive airship and whisks him away to far-off and frightening lands. Bonus Fact: The most striking thing about the blimp in “Chitty Chitty Bang Bang” is that it was an actual, fully functioning airship. Built in 1967 by Malcom Brighton, it was only the second airship built in post-war Britain, and the first to fill up primarily with helium rather than hydrogen. The ship was modelled after a 1904 Lebaudy dirigible, with an envelope that was both short and deep, as well as symmetrical fore-and-aft. The Lebaudy was known for its hooked appearance, which was replicated by pointed ends above the center of the envelope. In terms of measurement, the envelope was 112 feet long and 30 feet wide, giving it a total volume of 37,000 cubic feet. Amusingly enough, the whole thing was powered by just one Volkswagen Beetle engine putting out 40 horsepower to drive the two double-bladed propellers. When it comes to turn-of-the century exploration, nothing tops the aesthetic of airships. When intrepid adventurers need a well-stocked passage to some faraway destination, dirigibles deliver – and this film shows it. Synopsis: One Victorian man must assemble a team of four to travel to the uncharted Arctic, where his son has disappeared. Upon arrival, they find more than they bargained for with a group of Viking descendants who will stop at nothing to ensure their existence remains a secret. While the blimp in this movie has very little screen time, it’s essential to the plot. The only reasonably quick and safe passage to remote areas in the time the movie is set would have been airships, and the one that carries Sir Anthony Ross to the Arctic in search of his son is named the Hyperion. Bonus Fact: The Hyperion airship was designed by Disney’s production team, under the guidance of Peter Ellenshaw. While nobody ever flew it, the 1974 press kit made sure everyone knew that the team had consulted Goodyear blimp pilots, who confirmed it as being theoretically air-worthy. After the film’s release, the Hyperion was slated to become a major attraction at the upcoming Discovery Bay planned for Disneyland in Anaheim, Calif. It would have been one of the first virtual reality rides in a major theme park, using real film and moving platforms to simulate an adventure over the Arctic. Unfortunately, the movie bombed at the box office and the ride was scrapped altogether. If you want to see the Hyperion today, you can visit the Paris site of Euro Disneyland, which has a life-sized replica of the ship integrated into the theater and café complex of Discoveryland. This movie shows that there’s room for zeppelins even in gritty sci-fi films. While it underperformed in box offices during its original release, its current cult status means there are many fans of its futuristic blimp design. Synopsis: In a neo-noir future run by mega-corporations, Rick Deckard must re-enter the Blade Runner force to stop the machinations of four replicants who have arrived on Earth. Though zeppelins don’t figure heavily in the actual plot arc of “Blade Runner,” the giant ad blimp is a huge source of aesthetic punch for the movie. Seen from below, the futuristic zeppelin looms over the characters and viewers, projecting ads from the mega-corporations as well as bright surveillance search beams. The craft appears almost like an alien vessel in its sheer size and brute technological force. It creates contrast between the concepts of Earth and the off-world colonies, and so is very important in the symbolism of the film. Bonus Fact: The “Blade Runner” blimp was made possible by some impressive feats of engineering and a whole lot of elbow grease. For instance, the model was equipped with multiple fiber-optic light bundles, which were operated with a series of remote-controlled prisms. To create the flashy and frightening spectacle of the airship, the crew utilized multiple light sources, multiple exposures and lens flares. These were partially based off the technology in “Close Encounters of the Third Kind,” and they certainly help lend the off-world ad blimp an air of alien horror. Possibly the best-beloved and most recent film on this list, Pixar’s animated feature “Up” represents blimps in a big way. In keeping with traditional dirigible tropes, the airship featured in the film belongs to a famed explorer – but with a few modern twists. Synopsis: Senior citizen Carl Fredrickson makes a magical journey to a remote area of South America as part of a promise made to his lost wife. Unbeknownst to him, he’s also brought along a young stowaway, and an adventure waiting to happen. Airships are vital to the story from the very beginning, with 8-year-old Carl depicted practically worshipping adventurer Charles Muntz and his daring dirigible exploits. In fact, the Spirit of Adventure – both the aptly named airship and the passion for exploration – is what brings Carl together with his future wife Ellie. When Muntz is called a hoax, he flees in disgrace to Paradise Falls in his blimp. After Ellie passes away, Carl ends up tying an inordinate amount of balloons to his house in order to float the entire building up and away, all the way to Paradise Falls with Russell – a young Wilderness Explorer – in tow. There, they engage in many madcap adventures, including a classic mid-air battle on the evil explorer Muntz’s airship. The Spirit of Adventure ends up in the capable hands of our heroes Carl and Russell, who make their way back to the city with their new talking dog friend Dug. Bonus Fact: To find clues about the dimensions of the Spirit, you can look to a few frames in the movie itself. In the beginning of the film, there’s an old news reel that describes the dirigible as being longer than 22 prohibition paddy wagons. With a little digging, you’ll find that the average paddy wagon at the time was about 25 feet long – meaning that the theoretical Spirit would be a whopping 550 feet or greater! That would make for a hull diameter of about 100 feet. Like many fictional airships, the Spirit of Adventure is based on the grand old LZ 127 Graf Zeppelin. In a futuristic twist, the Spirit has an impressive eight engines that are capable of swiveling forward and backward – much like the famed U.S.S. Macon. The Macon and Akron also inspired the sky hooks and hangars found in this film. As you can see, blimps never actually went out of style. In fact, they’ve been right under our noses for the last 50-plus years in movies and other media. They’ve also been above our heads, like the beloved MetLife blimp, which has been in circulation since 1987. Blimps capture our imaginations as well as many of the events that make our lives rich. From sporting to community events, blimps can both record important images and get your message across in an unforgettable way. 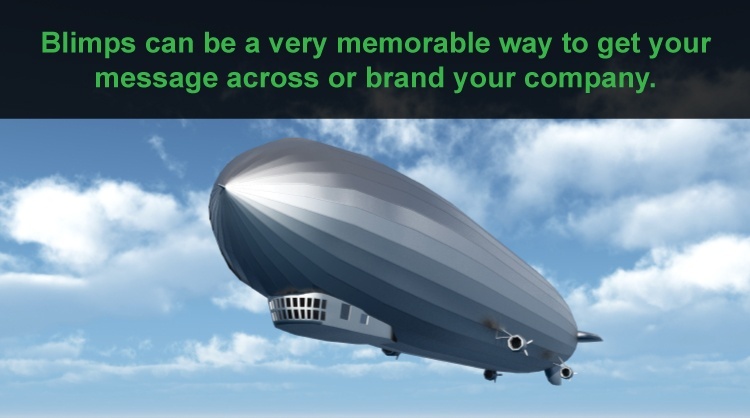 Aside from being a stylish way to build and brand your company, blimp advertising is extremely versatile. Blimps of all shapes, sizes and technological specifications are available to you with Van Wagner Aerial Media. Out of the estimated 13 active airships in the world, you can find eight in Van Wagner hangars. In addition to MetLife, Van Wagner Aerial Media also operates the DirecTV blimp. No matter your needs, you can find an advertising solution. There’s a reason the biggest companies choose to spread the word with airships; they’ve seen the benefits of blimps firsthand, and you can too. Get a free quote on a blimp today by clicking the button below.